In spite of the excellent engineering that has continuously been put into the manufacturing of Mercedes-Benz, the car, like many others, still experiences a few problems of its own. This is especially common in older models that have automatic transmission. These vehicles give exemplary performance while on the road but after a while, the chassis flex disc may require replacement. A chassis flex disc is a device to which the shaft flanges, both the input and output, are attached. There are 2 flex discs in the Mercedes, both of which are made out of toughened rubber. Despite the rubber being tough, it can still expand and contract due to changes in temperatures. The flex disc acts as a connection that brings together the differential, transmission, and drive shafts without actually connecting them directly to each other. Of the two discs in the Mercedes, the front flex discs performs the function of connecting the drive shaft to the transmission shaft, while the rear flex disc connects the drive shaft to the differential shaft. Moreover, the flex disc shields the drive shaft from vibrations when the transmission shaft transfers power to the differential shaft. The flex disc is also tasked with absorbing some of the torsional loads when the vehicle speeds up or slows down. The flex disc is exposed to different elements that can all affect its functions. This includes the temperature that changes depending on your location as well as other vehicle functions such as the running of the engine. This change in temperature causes expansion and contraction that in turn leads to wear and tear of the disc. The same change in temperature can also cause cracks to start forming in the flex disc. Due to its position underneath the car, the AirMatic suspension activities also expose the disc to further wearing. A disc is held in place by bolts and nuts; these will fall off when the flex disc becomes too worn out. A worn out chassis flex disc will adversely affect the overall performance of the car. Some of the signs that the flex disc is failing include difficulty when shifting gears. This is especially noticeable when parking the car or shifting into reverse. The gears will move forcefully as a result of transmission issues. You will also experience general discomfort while riding in the car. This discomfort can be characterized by vibrations in the car. This is as a result of the drive shaft experiencing the transfer of power through the transmission shaft. This causes the flex disc to move around, causing irregular and uncomfortable movements in the car when in motion. As the flex disc moves and knocks around, this will cause some noise to be produced from under your car. The noise will be much more noticeable when you accelerate. There are some simple tips that you can employ to ensure that you enjoy a smooth, comfortable ride with the flex discs working efficiently. One of these tips is to tighten the nuts and bolts that hold up the flex discs. In case of cracks in the flex disc, you will need to replace it with a new one. This can also be done using a wrench to loosen the nuts and bolts and then replacing it with the new one. Fitting it right into the spot where the old one was is simple and clear. Another tip that you should remember is to remove the bolts connected to the drive shaft first before moving to the others, and then follow this with the one connected to the differential shaft. In the process of putting it back, the order should be reversed. Preventing the chassis from failing is a good way to avoid the trouble of having to replace it in the first place. This can be achieved through regular checkups and servicing of your Mercedes. 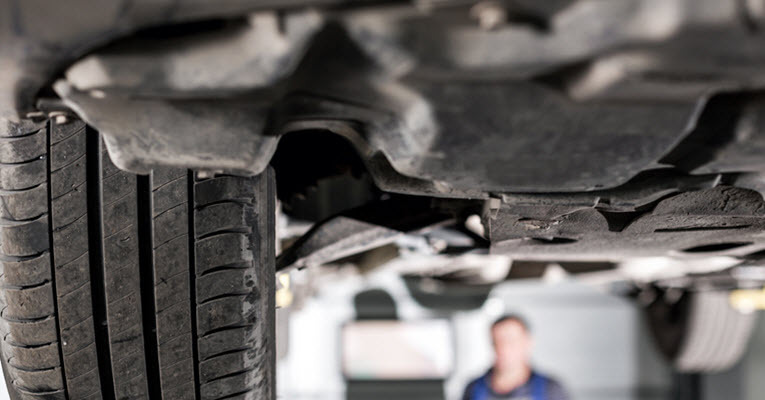 At Hayes European, we are experienced and ready to help you maintain the comfort and performance levels of your Mercedes- Benz as soon as you call us. We are conveniently located to serve owners living in and around Santa Cruz, Aptos, Soquel, and Capitola, California. * Mercedes-Benz C-Class image credit goes to: teddyleung.